At the leisurely pace I’m going, Marvel’s Daredevil on Netflix is going to keep me busy here for quite a while. The next review will be up shortly, but it will probably take me until the middle of May to finish my individual episode reviews. Though honestly, I can’t see how that’s a bad thing because I’m having a lot of fun writing about it; I might as well drag it out and milk it for all it’s worth! For now, let’s look at the episode “In the Blood.” Which incidentally features a lot of blood for us to “be in,” though the title of the episode obviously refers to something Wilson Fisk says on his date with Vanessa. But I’m getting ahead of myself! Our story begins in what looks to be a strong contender for “worst place on Earth,” namely “Utkin prison, Siberia.” Eight years ago, the Russian brothers Vladimir and Anatoly Ranskahov, whom we were introduced to in the first issue, were imprisoned here until they were able to escape to freedom using broken off pieces of ribs from a dead cell mate. It doesn’t get much grittier than this. Before escaping, they make plans to go to America, rather than return to Moscow. In the present day, we see Anatoly escape through a back door, with Matt looming above, having tossed another one of his gang through a window. They probably should have gone back to Moscow. In the next scene, Matt is being stiched up by Claire who is still hiding at her friend’s place where she is cat-sitting a cat she’s allergic to. There is mild flirting going on. Matt, obviously pleased with their arrangement – though not necessarily with the fact hat he’s put her in harms way – hands Claire a phone for her to put her number into so that he can reach her more easily the next time he’s in trouble. In another part of town, Wesley walks into Veles Taxi where he has a serious talk with Vladimir and Anatoly, about the “man in black” and the brothers’ general ineptitude. Other Marvel characters are alluded to (see the Easter egg section! ), in a scene that became popular from the first moment we saw it in the trailers. The brothers have a difficult decision to make with regard to how to proceed with Fisk. We next cut to Karen who is meeting with Ben Urich at a diner. Not only is the meeting quite frustrating for Karen, who is discouraged by Ben from moving forward, she also becomes aware of all the other people who have died in the wake of what happened to her and what she uncovered. Both her former boss, and the two men who tried to attack her have turned up dead. Ben also hints at the things he’s uncovered about Karen’s past. The man Matt tossed into a dumpster in the second episode gets a visit in the hospital from Vladimir and Anatoly who wake him up with a shot of adrenaline. This is how they learn about Claire, and where to look for her, something they hope will lead them to the man in the mask. Next, two other Russians show up in Claire’s apartment where Santino spots them. Unfortunately, they see him too. Wesley and Fisk are out for a drive in his car, where the “masked idiot” is now a topic of conversation. Fisk has other things on his mind as well. When the car stops, he asks to go alone, and enters Vanessa’s gallery. 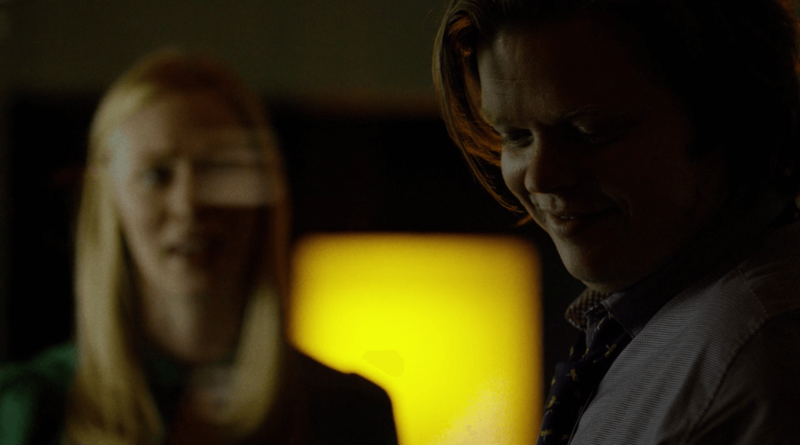 The two have a conversation that ends with Wilson Fisk asking her for a date. Vanessa accepts. Claire, still at her friend’s apartment gets suspicious when she hears noises in the building and takes out her phone to call Matt. She relaxes when she realizes it’s just a neighbor. Or is it? Meanwhile, Matt and Foggy leave the police station and walk down the street discussing the choices they’ve made. Foggy misses free bagels and elevators – and even longs for a fax machine – while Matt reminds him of the bigger picture. Just as Foggy is about to get in a cab, Matt gets a call from Claire who is screaming on the other end. Matt runs to get to her, but is too late. Before Claire’s kidnappers take off, Matt catches the name Santino. We next find Karen at an auction where Union Allied office supplies are being sold off. She is surprised to see Ben Urich show up. He instructs her to keep bidding and buy something while keeping track of some of the others in the crowd. It looks as if they are both still on the case Karen was told to walk away from and that Ben appeared to show no interest in pursuing. Things are not looking great for Claire. The Russians arrive at Veles Taxi with her kicking and screaming in the trunk. She puts up a mean fight. Matt has made it to Claire’s own building where he finds Santino who who confesses that he revealed Claires’ new location after they threatened him and his family. Matt asks him for any details he might remember, and gets a very hot tip. Santino saw the Russians push Claire into a cab owned by Veles Taxi, and Matt immediately knows where to go next. Wilson and Vanessa are seen having a much better evening, enjoying dinner together. Claire has been beaten, but is still putting up a fight. She is asked to reveal Matt’s name, but obviously cannot, as he hasn’t told her. When the lights suddenly go out, Claire knows that they have company and starts laughing. Under the cover of near darkness, Matt starts taking out the bad guys. With just one guy left standing, Claire helps out with a baseball bat before the two of them embrace. Karen meets up with Ben again and tells him about what happened at the auction. Ben reveals that he didn’t go there looking for her, and that that he was there becuase he was still interested in the story. Ben lays down the rules for them going forward, and urges her to take the deal with Union Allied. Vladimir and Anatoly show back up at Veles Taxi and find their men beaten. Realizing that they clearly do need help on their end, Anatoly decides to take Fisk up on his offer and goes to see him. Wilson and Vanessa are having what seems like an excellent time on their date when Anatoly shows up and causes a bit of a scene. His timing could have been better, and we already sense that this was a terrible decision. Fisk asks Wesley to put Anatoly in a car. Back at the office, Karen sheepishly admits to Foggy that she bought a bunch of office supplies. Foggy doesn’t seem to mind one bit. Back at his place, Matt patches Claire up. He finally tells her his real name. Meanwhile, Vanessa and Wilson say their awkward good-byes outside her building. Vanessa is clearly having second thoughts about him, and Fisk is growing desperate. Anatoly, who thinks he’s just out for a ride in Fisk’s car, has a talk with Wesley about “the man in black” before they come to a stop. Fisk then reaches in and drags the Russian out, beating him to a pulp before decapitating him with a car door. It’s a gory affair. It’s always a good thing to have a trusted associate who can hand you a handkerchief to wipe the blood off your face when you’ve killed someone. Fisk walks off with ominous music pounding in the background. This was another really strong episode, that stands out to me mostly because of the many strong individual scenes and moments. 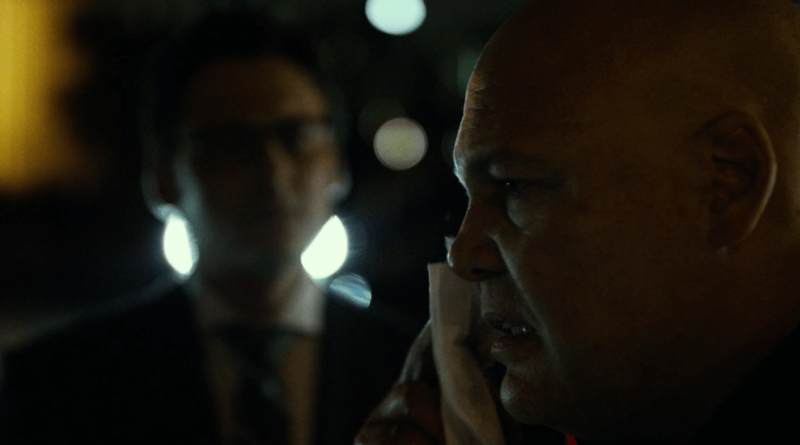 This is the first episode where we get to spend any real time with Wilson Fisk, and there’s such an interesting contrast between the gentle giant we see courting a woman, and the beast who shows up at the end. Vincent D’Onofrio himself has talked of his character as “a child and a monster,” and both make an appearance in this episode. The scene of Wilson and Vanessa in the gallery is worth pointing out for several reasons. D’Onofrio and Ayelet Zurer have fantastic on-screen chemistry, which is a must if we are to find the two of them at all convincing as a couple. They perform a kind of dance that is impossible to take your eyes off. Then there’s the contrast between her wearing all white, and him in all black, against the backdrop of a pice of artwork that looks like it’s on fire. Gorgeous stuff. At the same time, another relationship, that between Matt and Claire, is in the same awkward phase, though their scenes together are not brightly lit, but play out mostly in the dark, framed by pain and violence. They’re (presumably) the good guys, but while Wilson and Vanessa drink expensive wine, Matt and Claire get to tend to the other’s physical and emotional wounds. There is still some charm in their scenes together though, and just enough light to not leave us wallowing in misery. We learn some interesting things about Karen this episode. Or, rather, we have Ben allude to the existence of a backstory that is sure to get us speculating, considering the many twists and turns Karen’s story took in the comics. It adds quite a bit of spice to her character, even though her scenes with Ben drag on for just a little too long. I have to admit, though, that I love Foggy’s reaction to Karen coming back to the office with a fax machine. He should be livid considering that Karen bough the equipment for very scarce company money, but he isn’t. In his previous conversation with Matt, before the latter is called across away on vigilante duty, it was Matt who had to urge Foggy to remember the big picture, and not dwell on what they left behind. Perhaps a silly fax machine is a reminder to Foggy that he may be on the right path after all, running a business with Matt, and now Karen. It’s a very sweet character moment for both Foggy and Karen. Finally, this review wouldn’t be complete without mentioning that final, very violent scene, in which Wilson Fisk butchers Anatoly. It is extreme, and I am certainly sympathetic to anyone who thinks they may have taken it too far. It is also, however, incredibly effective in establishing Fisk as a very dangerous man, and a real threat to everyone who crosses him. Last episode, we saw a man kill himself for fear of what might happen if Fisk got his hands on him. Leading up to that, he’d been established as someone whose very name could not be mentioned. In that context, we needed something out of the ordinary in terms of brutality to make sense of the things leading up to it. The fact that he goes to these lengths because he was embarrassed on a date makes him all the more interesting. It also brings home the point that one of the things he and Matt have in common is that they may be their own greatest enemies. Not as many obvious auditory cues as in previous episodes, but it’s interesting to see Matt use a classic trick from the comics when he turns out the lights in the taxi garage, thus gaining more of an advantage on his enemies. Other than that, we are actually presented with a situation in which Matt’s own senses fail him. He goes after Claire, he catches snippets of a conversation, but actually fails to keep up and loses the trail. Not surprising considering he doesn’t have super speed, but a sobering reminder that Matt Murdock is neither Thor nor Iron Man. Nothing to report except maybe Matt’s new phone, which has only one number saved after Claire puts hers in. This obviously keeps things simple for Matt, who would be a fool for bringing his smart phone along while fighting crime. Wesley’s mention of “an iron suit or a magic hammer” is clearly a nod to Iron Man and Thor, and a not so subtle reminded that we’re watching a show which takes place in the larger Marvel Cinematic Universe. Near the end of the episode, there is also mention of a (Melvin) Potter – Wilson Fisk doesn’t mention a first name – who can be called upon to get Fisk a new suit. Melvin Potter is better known as The Gladiator, and a well-known character in the Daredevil comic. I’m going to have to go with Claire. I know some have made the point that Claire being victimized paints a less than positive image of the female characters of this show. Does this mean that there is never an appropriate in-story reason for a woman to fall victim to someone physically stronger, and later be rescued by a man without the story being deemed demeaning to women? I don’t really buy that. More importantly, Claire is a freaking rock star. She kicks, she screams, she fights, and she gets to swing a baseball bat. She’s as much a hero as any of us could ever hope to be in a similar situation. Regarding Claire, not only does she put up a fight, but (while she is taken to get at DD) what happens to her is ultimately a result of her own actions. She chose to haul Matt out of a dumpster and treat him herself. She chose to help him torture Semyon. Actions like those can’t be without consequences, and your typical ER nurse (whatever their gender) isn’t going to be a serious match for a bunch of mobsters. 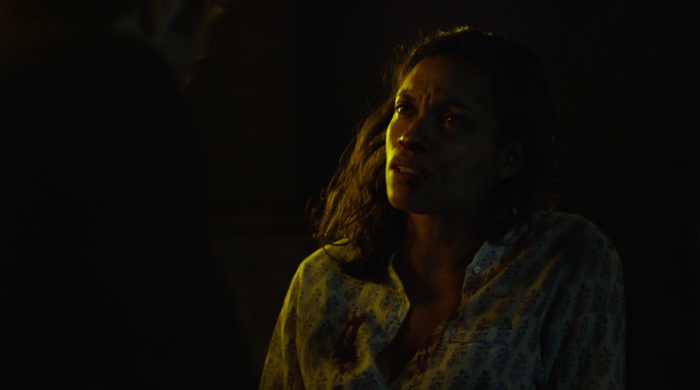 – I know a lot of people like Ben Urich, and I have some fondness for him, too, but I felt throughout most of the series that his scenes went on a bit longer than necessary. This becomes more of an issue for me latter, but it starts here in this episode for me. – I think the introduction of Vanessa and Wilson Fisk were well handled. Especially Fisk, who we see both as a gentleman and as a monster in this episode. – I thought the scene of Matt patching up Claire was well done, and Matt giving her his real name was such a simple thing, yet showed a large measure of trust and change in their relationship. 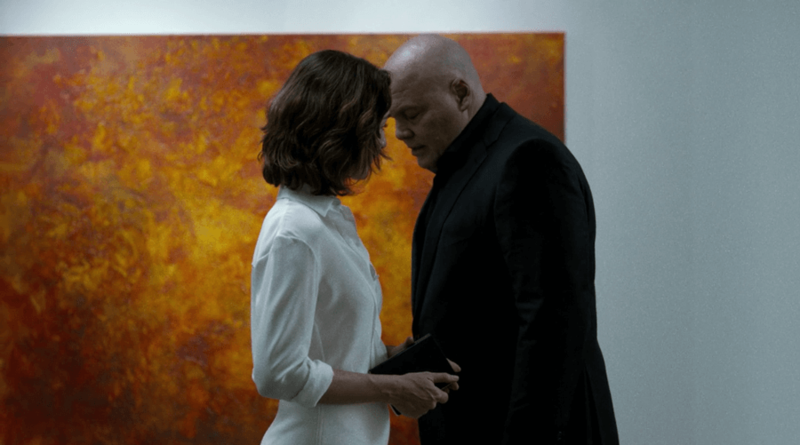 – I’ve been wondering about that firey painting used as a backdrop for Vanessa and Fisk. Does it remind anyone else of the “world on fire” effect of how Matt “sees” the world? 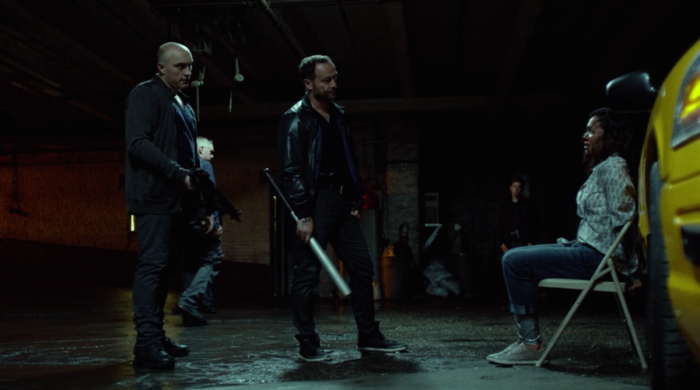 Is it some sort of foreshadowing of Daredevil interacting with these two? Or is it merely my overactive imagination? – Really liked turning out the lights in the garage to disorient the Veles Taxi guys. I don’t get the people who’ve said this show’s female and minority characters are weak or underdeveloped. Karen and Claire both are amazing characters. They have there flaws yes, but thats called being human. And yes Matt has to save the day a few times, but the show is about him. If Jessica Jones spends her series being a damsel in distress, I’ll be the first one to complain. And I know I’m repeating myself, but the chemistry between Cox and Dawson is intensely palpable. I would love it if they forego the predictable relationships from the books and bring her back in a larger role in season two as Matt’s main love interest instead of Karen. i think you glossed over, what has to be, for me, one of the most disturbing scenes in the series. fisk beats the crap out of anatoly, then obliterates his head with 22 slams of a car door. 22. i know the term applies as he no longer had a head, but saying someone was decapitated makes it sound clean and quick, and this was hardly that. i’m not complaining. i love the show. i was just shocked at how much violence they had. i watched the 1st 10 eps in 1 day and the last 3 the next. i wished i would have stretched it out, but, i did rewatch it about 1 or 2 eps a day, and will watch it again before season 2 starts, depending how all the other shows line up.